I first encountered Doret Canton and her singular blog when I read this post back in May, 2008. She was saying nice things about my book, Six Innings, so, naturally, I fell madly in love. In today’s world, that means: We read each other’s blogs. I recently asked if she’d be willing to be interviewed. And, hey, look, here she comes now . . .
Doret, though we’ve corresponded sporadically over the past year, I really don’t know much about you. So let’s start with some basic facts: Who are you? Well, you know my first and last name and I’ll throw in my middle initial for free: Doret A. Canton. I am from the Bronx, N.Y. Though for some reason I never got an accent. I’ve been in Atlanta since 1996 and I still don’t have an accent. I am pretty sure I am immune to them. I didn’t learn about children’s literature in an air-conditioned classroom or office but rather on the unforgiving retail floor. Now I can pretty much hold my own in a conversation about children’’s literature, and if need be I’ll fake the funk. Doret, I’ve been faking the funk all my life. In the “kidlitosphere,” you represent an under-served population and offer, I think, a valuable perspective on children’s literature. You are a bookseller. And an African-American. And definitely not “inner circle,” whatever that may be. As a minority, I know how it is not to be represented or to find your stuff in the back corner. So on my blog and the displays I do at work I always strive for balance. About a year ago, I looked at the YA table and I noticed it was all girl-centered titles except for Stormbreaker, by Anthony Horowitz. My first thought was OMG, how did I let that happen? What does that say to the teenage boys who pass this table? Now the table its about 50/50, and I feel much better showing it to teenage boys and mothers who have sons. When the holidays roll around I check the calendar so I know when Hanukkah begins so I can get the books out on time. I may not always achieve balance . . .
. . . but I always strive for it. It’s the same with my blog. I just want people to come and discover authors they may not find elsewhere. What motivated you to blog? Before I started my blog, I was a bloghopper, leaving one or two comments. I finally wanted to start my own after finishing a YA book by an African-American author because I knew there was nowhere to talk about it. I noticed there didn’t seem to be many African-Americans blogging about children’s and YA lit. So I said, Why not? When I was thinking on blog names I knew I wanted something that reflected my melanin. So people who visited would know which box I checked in the last census. When I started a little over a year ago, I didn’t know where I was going to go with it but I knew I wasn’t going to review only African-American authors. I enjoy reading many authors, styles, and genre. I wanted that reflected on my blog. (No one puts this bookblogger in a reading corner!) It was really slow going in the beginning. I was like, “Hello, is anyone reading?” I started to feel like that always-falling-down tree in the forest that no one hears. Early on I was lucky enough to get some nice links from Kelly Herold over at Big A Little A and Jen Robinson. Those links felt like welcomes and encouragement. So thank you, ladies! I know what you mean. Those few people who reach out, provide links, and write comments are so important. Validation, you know; it’s not all navel gazing. So what have you learned along the way? Any surprises? I’ve learned to always be willing to stand by what I say and never blog angry. Site meter checking is the blogger equivalent to authors checking their Amazon ranking. For a while I was obsessed with checking my site meter to see who stopped by. I still get a kick out of seeing when someone from another country has visited. I love it when authors take the time to leave a comment. It means a lot. I had been thinking about trying to get to know you better for a while -– I’m curious about you, and you’ve always been nice to me -– but one of your recent blog posts sealed the deal. As you wrote in the poem: “I don’t like to play the Card/But this time I am licking the back/smacking it on my forehead and calling/B.S./And that’s what this rant is about.” Have you gotten any response from that self-proclaimed rant? I’ve only gotten positive responses for the rant. It would be easy for me to go on about authors of color being under-represented online but I don’t want to come across as the angry Black girl — besides, do it too much no one will listen. I decided I was better off exposing the few people (and I am not being humble, I have site meter, remember) who visit my blog to diverse reviews. I try to have fun with my reviews. I just hope my love or enjoyment of the books comes through. If you want something more professional, go to Kirkus or SLJ or someone with a degree. I simply do me and that makes it fun. To do anything else seems like work. One time I did up my review game for Zetta Elliott‘s YA novel, A Wish After Midnight. For two reasons: 1) It was a self-published book, and I wanted to give people a reason to take a chance on it; and 2) I wanted to prove to myself that I could write a slightly more professional review. But I did stay true to me. Towards the end of the post I have, “Don’t roll your eyes” in parenthesis. I like to think of that as my Duckie prom moment. Remember, Duckie got dressed up for prom but still wore his crazy shoes? Um . . . nope. I have no memory of a Duckie. In crazy shoes or otherwise. But don’t let that stop you. I won’t. Whenever I can fit in an 80’s movie reference like “Pretty In Pink,” I’ll do it. I think a good review is honest with a little heart in it. That statement probably doesn’t include New York Times reviews, but since I have yet to understand one from beginning to end, I am not entirely sure. Well, I loved Lisa Von Drasek’s review of Six Innings in The New York Times Book Review. But I do think that’s what’s great about your blog, specifically, and great about blogging, generally. No one needs authorization to blog (read: speak your mind); you just do it. Now more voices can be heard. The dialogue has become more open and inclusive. One of the great things about blogging is freedom, to share. There is no order to my blog but that’s my choice. One of the beautiful things about blogs is individuality. It’s like what you said before, about not knowing where it might lead. You start a blog and then, gee, you wonder, What is this, exactly? What have you gotten yourself into, you know? So you make it up as you go along, and gradually it becomes perfectly itself. But please, Doret, let’s turn the conversation back to me. You’ve said that you enjoy my recurring “Fan Mail Wednesday” feature. What about it do you like? I love Fan Mail Wednesday, wish more authors did it. I like the way you take the time to interact with your fans. Your responses are fun, honest, witty and show much respect and appreciate for your fans. Can you bring back the dog who was speaking to President Obama? Thanks for that. A funny thing about those two “letters to the president” my dog wrote: They were by far the two most popular posts on my blog. You can imagine how much I resent Daisy for that. Now I feel like Daisy, my Goldendoodle, should have her own blog. But the problem is I have this job that gets in the way –- and a career to relentlessly, shamelessly self-promote. of me, Me, ME! Look: I’m SQUINTING!!! No, not coasters – but they do make great furniture. Every house should be filled with them. Doret, you are obviously crazy about baseball. What are the baseball books you are recommending this season? The Prince of Fenway Park by Julianna Baggott. I loved this one. So far this is my favorite baseball book of the year. Babe Ruth and the Baseball Curse by David A. Kelly, illustrated by Tim Jessell. This was a great early chapter baseball book. I’d highly recommend it for baseball fan parents who are looking for something a little longer to read to their child. Mudville by Kurtis Scaletta. I loved the way the main characters were developed. Mighty Casey by James Preller, illustrated by Matthew Cordell. As always I really enjoy your text J.P., but it’s Cordell’s light and easy illustrations that make it okay for me to add it to this list (don’t want people to think I am playing favorites). And that really did look like pee! Baseball Crazy edited by Nancy E. Mercado. Great collection of baseball short stories, from authors such as Jerry Spinelli, John H. Ritter, Sue Corbett, and more. Top of the Order by John Coy. If a parent came to me and said my son hates reading but loves baseball, I would show them this book. Coy took the time to create four characters and situations boys could relate to. This book could show many reluctant readers that reading isn’t so bad. 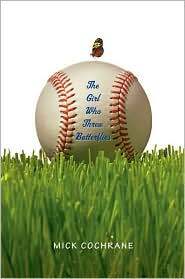 The Girl Who Threw Butterflies by Mick Cochrane. It’s about a girl who pitches on her eighth grade baseball team, with a wicked knuckle ball. Change-Up Baseball Poems by Gene Fehler, illustrated by Donald Wu. I loved everything about this collection of poems. The text and the illustrations are a beautiful match. The Brooklyn Nine by Alan Gratz. I know this is a great baseball book when non-baseball fans are giving it great reviews. Ray and Me by Dan Gutman. I take Gutman’s baseball card adventure series for granted because its always so good. I do plan on reading this one. It’s about Ray Chapman, the only major league baseball player to get hit by a pitch and die in a game. You Never Heard of Sandy Koufax? by Jonah Winter, illustrated by Andre Winter. I saw this reviewed over at Fuse #8. My first thought was, That’s a beautiful baseball book I must read. The Baseball Talmud by Howard Megdal. This is the history of Jewish players in major league baseball. 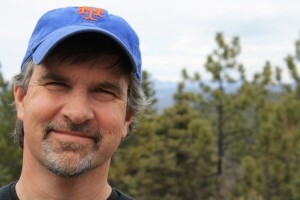 In a recent email, you asked me about, “your Mets.” It used to be “our Mets.” What happened? You haven’t crossed over the to Dark Side (read: Yankees), have you? I could never cheer for the Yankees. I agree, it’s like rooting for a Swiss watch. Roger Angell, who is one of the great pure writers of the past fifty years, says that people have more “Mets” in them than “Yankees” — that we’re more shaggy dog than exalted champion. That quote couldn’t be more perfect, and I will always root for the Mets. Five favorite books you love pressing into customers hands? Neo-Soul, Pop, Rock and Jazz. Anything with a good story line that doesn’t rely on special effects. What other sites can you recommend that celebrate diversity in children’s literature? To be fair, I do run across a few other reviews of authors of color at other blogs — but its not nearly enough. I am not going to do the percentages, that’s too much math for me. If I was to take a guess, even including the blogs I’ve mentioned, reviews of authors of color wouldn’t make up 5% of the kidlitosphere. That’s simply not right and there’s no excuse. It’s 2009, we have our first Black president; this should not be an issue. I don’t want anyone to stop reading and talking about the books they enjoy, but be more open and inclusive. Everyone should check out Diversity Rocks Challenge. It was started by Ali from Worducopia. This is a pressure-free challenge that encourages bloggers to add more color to their reading list I don’t do challenges — I am too lazy — but the Diversity Rocks Challenge requires no effort. After reviewing an author of color you simply link it to the site. That’s it, you come and go as you please. Also check out Crazy Colored Summer Reads over at Crazy Quilts. Edi has compiled a great list of titles featuring teens of color. Thanks for that info, Doret. Lastly: Ali or Frazier? Doret, my friend, thanks so much for stopping by. I really enjoy you and love that you are out there, shouting loud, staying proud. Keep up the great work. Shouting loud, staying proud — with those four words I am almost tempted to put up a Black power fist. Instead I’ll say thank you, James, for finding me interesting enough to want to interview. And please bring back Daisy, her fans are waiting.